Let us juxtapose two mechanisms of modernity’s mass culture: mechanically reproduced media and fashion. Both fields have “manna” narratives, in that the concerns and technologies of the early bourgeois-capitalist oligarchs filter and descend down to the masses. Segments of these same consuming masses are, however, productive of the manufactured needs in these fields (i.e., tastes). Pioneers on the figurative and literal streets—the DIY brigades—constitute a kind of research and design department. They are an unpaid vanguard whose activities may set the pace for the stylistic advancements of capital. The latest wave of fashion (which is cyclical) and the most fashionable development in “technoaesthetics” (which is linear) are frequently produced by those who do not capitalize on this production. Ernst Bloch wrote that “not all people exist in the same Now.” Among its other functions, fashion (as distinct from style or clothing) always acts as a semiotic policing to ensure the proper manifestations of this nonsychronicity. Meaning that fashion works as a single contingent set of checks and balances upon the system of power relations in any given society. This is not to claim, of course, that there is a direct correlation visible in all circumstances—a cipher key for What People Wear. But fashion as a system is not, is never, strictly rhizomatic. It has its sources in economic relations. It has its first justifications in moneyed interests. Fashion, an instrumentalization of nonsynchronicity, is therefore complicit. This goes for clothes, and it also goes for stylistic trends in cinema, television, and video. I am oversimplifying matters here for the purpose of a premise that in the culture industry all activities, even ones of critical resistance, are necessarily negotiations rather than pure negations. 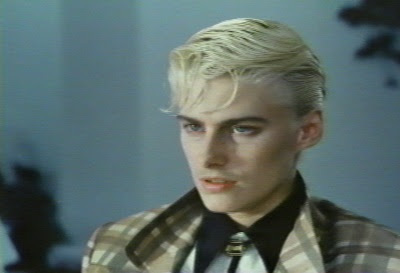 In Liquid Sky the character Margaret (Anna Carlisle) tells her old art instructor (a part-time lover and apparently something of an aging radical) that his generation’s blue jeans, free love sloganeering, and revolution were a costume—a performance, a posture—as much as her own generation’s self-stylings. The only difference is that her generation knows and acknowledges this fact. The way Liquid Sky imagines fashion breaks down according to the specific level of engagement we isolate. On one hand, there is the depiction of trends. For example, Dave Kehr notes that the film “capture[s] the neopuritanism of the new wave movement.” That is, one can read the film as a document or representation of a scene—a scene that exists in reality, independently of this film that depicts it. From there one might pronounce judgments on the subject matter of the film itself. On the other hand, there is apart from representation, the participation in trends. For instance homemade aesthetics—literally homemade (Liquid Sky was filmed in and around a penthouse), but also participating in a ‘leftovers’ type of mediascape, that imagined (differently) by something like Videodrome or Stephen Sayadian’s work, too, wherein the B-grade parsimony of the images is a deliberate aesthetic effect. The text is part of a low-budget sphere of image-making—costing only a half-million dollars, lacking truly round and convincing sets and bursting with DIY decoration (descended from punk—very): the film has the neon fingerprints of its creators all over it. It is precisely this “low,” inexpensive, pop-musical, youth-oriented aesthetic Soviet émigré Slava Tsukerman and his crew enact that connects this film in some kind of unspoken international fraternity, a Cold War counter-discourse. Much American film production in the 1980s was marked by jingoism and interventionism. Even irenics were often of an authoritarian bent (Rocky IV truly, unironically, is one of the landmark cinematic texts of the Reagan era). The consideration of geopolitical violence carried with it only rarely a consideration of geopolitical history. The inverse of this unthinking, unflagging chauvinism is, I would argue, a range of conspiracy texts that mark the years from Nixon through George H.W. Bush. (Fredric Jameson has written cogently on this theme in a chapter of The Geopolitical Aesthetic.) The conspiratorial accusations of much low-grade genre coding in the 1970s and ‘80s made for rather fascinating cinema all along the high-low divide. I am thinking of David Blair’s Wax, or the Discovery of Television among the Bees (1991) and Mark Rappaport’s Chain Letters (1985), for starters. This tendency to make sense of politics as arcane and perhaps extraterrestrial, the workings of an omniscient order of powerful beings, extends weblike through much of cinema. At its root, I think, it expresses the concerns of a mentality which—unlike that of the Stallonist-jingoist—do not identify with government (or US) power and do not trust the benevolence of its operators. Conspiracy was the narrative mechanism by which new and inorganic communities were produced—all as results of shadow powers. The dual video age themes of conspiracy and cliques sometimes converged—they converge in Liquid Sky. The film’s fringe vanguard fashionistas being orgasmo-murdered by vampiric aliens (depicted only as optic nerves) makes for an interesting comment on the unwittingness of the pop avant-garde cliques—the R&D departments of capitalism—in the post-Nixon, post-1960s counterculture Cold War milieu. The nodal points of the early video age have in fact proven to be a rich mine to vein. The mining started early enough, as commercial films soon became weird and neon-gritty, too: recall not only the street/youth films like Beat Street (Stan Lathan, 1984), but also Alan Rudolph’s Trouble in Mind (1986) or Walter Hill’s Streets of Fire (1984). If, by the mid-1980s, the “new wave” could be co-opted and “upgraded” to commercial cinema as a look, a feel, a selling point, then it isn’t until, say, 2008 that the unclean age of analog (the vital antithesis of neon new wave cleanliness) finds its synthesis realized. Meaning: the technology is as important, and as apparent, as the décor, the attitudes, and the mise-en-scène. Just look at the latest Snoop Dogg video, a brilliant work, “Sensual Seduction” (directed by Melina Matsoukas). At this point it is not simply the depicted image but the way the image is captured and produced that become a desired effect. To hold a screening of Liquid Sky in 2008 and to assume its continued relevancy or worth is, I think, a call to bear this technoaesthetic transformation in mind.